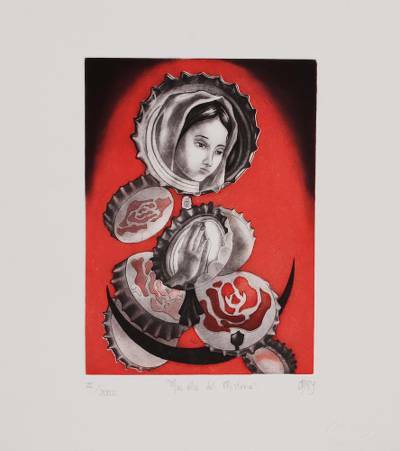 Signed Surrealist Print of Mother Mary from Mexico, "Beyond the Mystery"
Inspired by the mystery of religious scriptures, Mexican artist Adriana del Rocio creates a fascinating surrealist composition, presented by Contemporary Graphics Studio. Against a field of red, the face and praying hands of Mother Mary are captured within tumbling bottle caps, surrounded by roses. The artist works in a traditional printmaking style, etching the composition into resin to be applied with ink. Titled Más allá del misterio in Spanish.